I had a recent request from a customer getting ready for Easter that wanted a bag topper and instructions for making Easter Peeps S'mores. 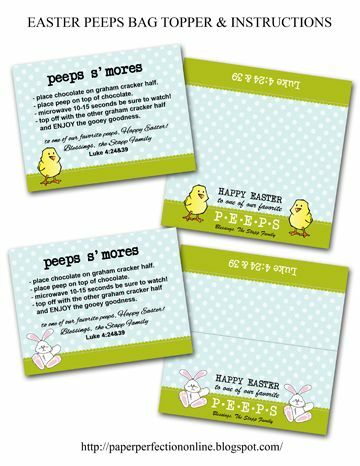 Here are the two designs I created because she purchased the original chick peeps and the bunny peeps and wanted printables for both styles. If you would like these Easter printables or a custom design for your Easter holiday contact Paper Perfection at jtanddolly@yahoo.com for pricing and details.